"Suspension of disbelief" is a term created by a British poet Samuel Taylor Coleridge in the 19th century. Simply put, it means accepting what you see/read, even though it is improbable or even impossible. That means putting away skepticism and logical reasoning. I remember reading about it as a student a while ago and thought that it was a pretty convenient explanation that accounted for the ridiculously boring poetry or prose that I was forced to read as part of the curriculum. I've never thought about it as an idea that could be used in considerations of modern fiction. 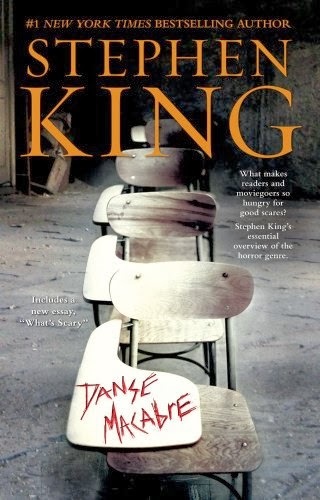 I wrote this lengthy introduction to introduce you to my latest entry on another book I've read and that changed the view I held - Stephen King's "Danse Macabre". Coleridge's idea is frequently echoed here and I think it's one of the factors that King, a writer and an avid enthusiast of horror fiction, uses to deal with the subject of his book. It's actually hard to call it a book. It feels more like a collection of essays that deal with various aspects of his beloved genre. He devotes a large section to the history of horror fiction. Not only in print, he also writes about radio, films and even comics. King reflects on some of the most influential novels in this genre and does so taking into account a sometimes surprisingly wide spectrum of works. It is an interesting read though not for everyone. As I've written earlier, King is a big fan of the horror fiction and talks about it with a lot of respect and enthusiasm, even when he reflects on ridiculous movies such as "The Blob". It's not a thrilling tale with interesting plot and well-developed characters but it offers some very interesting insights into horror fiction. Obviously, it is a subjective view but King's fans should find (most of) it interesting. There's at least one more thing worth mentioning. It is a quote from the new introduction that King added to the book in 2010 ("What's scary"). "We take refuge in make-believe terrors so the real ones don't overwhelm us, freezing us in place an making it impossible for us to function in our day-to-day lives. We go into the darkness of a movie theater hoping to dream badly, because the world of our normal lives looks ever so much better when the bad dream ends..."
In my opinion these words account pretty well for why we read/watch horror fiction. Being used to horror fiction makes watching your daily news on the tell with its regular dose of apocalyptic-disaster-murder a little bit easier. Or maybe we're just sick puppies. So that's another entry in my "book log". I've decided not to grade the book I write about here anymore. Seems pointless as I generally read only book that I like and if I don't, I simply stop.